Maes Y Berllan Barn01249 814525work Self-cateringMaes-y-Berllan Barn has been converted to a high standard with spacious rooms, disabled amenities, under floor downstairs heating, wood burner, patio, large enclosed garden and ample parking. Situated close to the village of Gilwern, three miles from Crickhowell and four miles from Abergavenny. 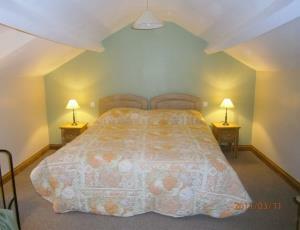 This allows easy access to The Sugar Loaf and Black Mountains, Brecon Beacons and the Industrial Valleys to the south. Maes-y-Berllan Barn has been converted to a high standard with spacious rooms, disabled amenities, under floor downstairs heating, wood burner, patio, large enclosed garden and ample parking. Ideal spot for walking, FREE fishing, caving (at Llangattock) mountain biking or even hang gliding from the Blorenge. Two local pubs within walking distance. A40 from Abergavenny. Turn left by the Bell Inn signposted Glangrwyney, after the metal(bailey bridge) take the next unsignposted turning left and follow the lane until you get to the second property.